Colleague had recently asked how can he reduce size of folder with large images. Archiving won’t work since most image formats are already compressed. Size of image files depends on image dimension, colors and format. So there are plenty ways to make image smaller. Except that it is troublesome to go through every image to tweak that. IrfanView has native batch module that allows to modify many images at once. add text (copyright, watermarks, etc) on images. task (convert, rename or both). This is enough to convert format. But there is more. Much more actually. Use Advanced Options allows to access many more functions to apply. Depending on what you need you can do anything here – from thumbnails to color corrections. In case of my colleague he had reduced image width to 1280px with preserving proportions and converted image to grayscale. This reduced his images from 2MB per to 600KB per. IrfanView is mostly covered as image viewer, but there are plenty of advanced function you can explore in there. Batch module is very convenient to process multiply images and can be lifesaver to get large collections in order (another lifesaver would be VisiPics). 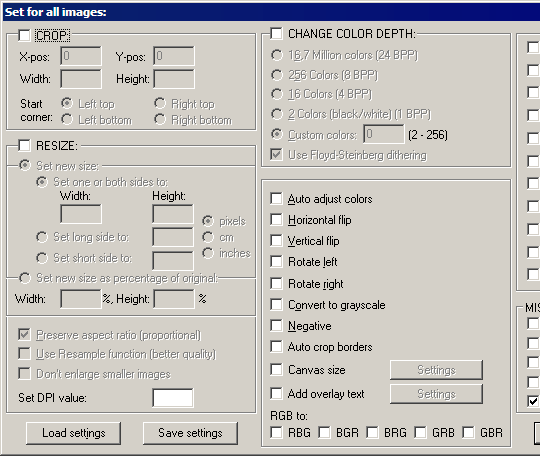 PS For another bulk image utility check out recent post about Digital Image Tool at ghacks.